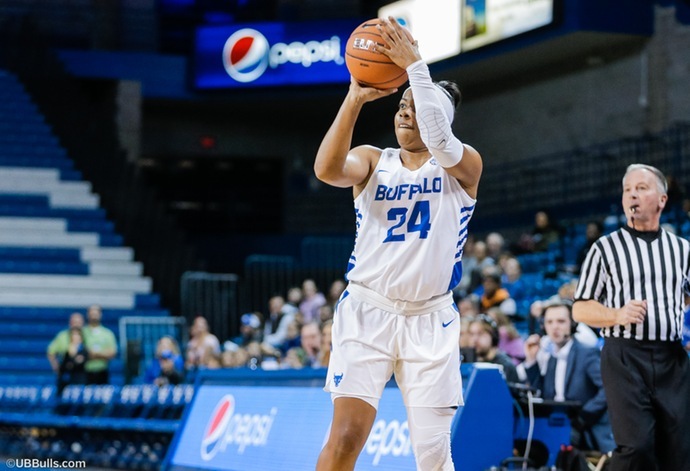 BUFFALO, N.Y. -- University at Buffalo women's basketball senior guard Cierra Dillard continued to rack up preseason honors on Monday afternoon as she was named to the Citizen Naismith Trophy Watch List, as announced by the Atlanta Tipoff Club. The Citizen Naismith Trophy is awarded each season to the Player of the Year in men's and women's basketball. Dillard is the only mid-major player in the country to make the watch list, a list that is comprised of 50 student-athletes from around the country including 11 players from the ACC and 10 players from the SEC. She is also the first UB women's basketball player in school history to earn a spot on this prestigious preseason watch list. "These 50 talented candidates are the ones to watch, and the competition for the 2019 Women's Citizen Naismith Trophy will heat up as more players enter the competition throughout the season," said Eric Oberman, executive director of the Atlanta Tipoff Club. "We are excited to watch these women play as they have another great year of college basketball ahead of them." The crafty guard returns for her senior campaign after putting together a strong 2017-18 regular season and a superb 2018 NCAA Tournament. On the year, the do-it-all guard led the Bulls by averaging 16.2 points, 5.2 assists, 4.1 rebounds and 3.0 steals while connecting on a team-high 85 three pointers and setting the school record for steals in a season with 105. The Rochester, NY native put on a show in the NCAA Tournament as she helped lead the Bulls to their first-ever Sweet 16 appearance and tournament victories. Dillard earned All-Albany Regional honors after averaging 29.0 points, 5.3 rebounds, 4.3 assists and 3.3 steals while shooting 49.1% from the floor across her three NCAA Tournament games. The lethal scorer went off for a career-high 36 points and six rebounds while connecting on seven three-pointers in the Bulls 102-79 upset victory over #6 South Florida in the first round. She back that up with a 22-point effort against #3 Florida State in the second round win before capping her tournament with an electrifying 29 points, six assists and six steals in the Sweet 16 loss to the defending National Champion South Carolina Gamecocks. Dillard opened up this season right where she left off as she was able to net a game-high 23 points, four rebounds and four assists in the Bulls' season-opening victory at Maryland Eastern Shore on Sunday. The 20+ point performance by Dillard was the 12th of her UB career and the fifth straight dating back to last season. The midseason 30 team will be announced on Feb. 11, 2019, and then the competition will be narrowed down to 10 national semifinalists on March 4, 2019. The four finalists will be named on March 22, 2019, and the winner of the 2019 Citizen Naismith Trophy for Women's Player of the Year will be announced on April 6, 2019. The Bulls will return to the court on Wednesday, November 14 as they welcome Big 4 foe Niagara to Alumni Arena for a 7:00 pm tip. Prior to the game on Wednesday, the Bulls will be honoring their historic 2017-18 campaign and team with the unveiling of a Sweet 16 banner in the rafters of Alumni Arena. The first 500 fans in attendance on Wednesday will receive a free mini replica Sweet 16 banner.